FILE - Teen migrants walk in line inside the Tornillo detention camp in Tornillo, Texas, Dec. 13, 2018. Thousands more migrant children may have been split from their families than the Trump administration previously reported. 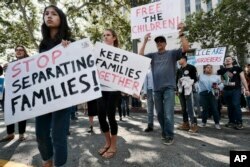 Protesters carry signs and chant slogans in front of Federal Courthouse in Los Angeles, June 26, 2018.